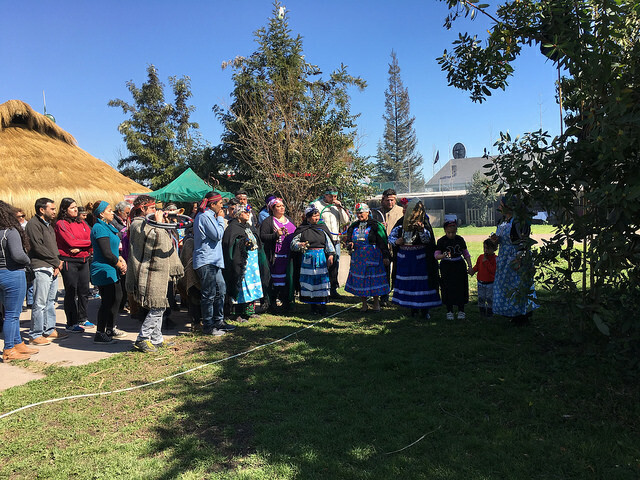 LA PINTANA, Chile, Aug 30 2018 (IPS) - The right to land and water, as well as to multicultural education, are the top priority demands of Mapuche leaders working with their communities in the Araucanía region and in Santiago, Chile’s capital. “We, the entire Cheuquepán Colipe family, are originally from communities in Lautaro (649 km south of Santiago). We’re here today because our elders had to move here. They could no longer plant crops and the forestry companies were harassing them,” one of the Mapuche leaders, Juana Cheuquepán, told IPS. “A sister of mine went to live there 20 years ago on my dad’s land. She has a well, but it dried up and they bring her water once a week for drinking, washing, her livestock and for sprinkling a little on her small garden,” she cited as an example. Because of this situation, “most of the youth and young couples move to the city,” she said. Chile has a population of 17.5 million, according to the 2017 census, of whom 12.8 percent identify as indigenous people. The Mapuche people account for 9.9 percent of the total population, equivalent to 1,745,147 people. Of that number, 35 percent live in Santiago and 18 percent in Araucanía, in the south of this long and narrow country. In terms of population, they are followed by the Aymara, Diaguita, Quechua, Rapa Nui and Lican Antai peoples. “I was born and raised on the ruca. As well as all my girls. 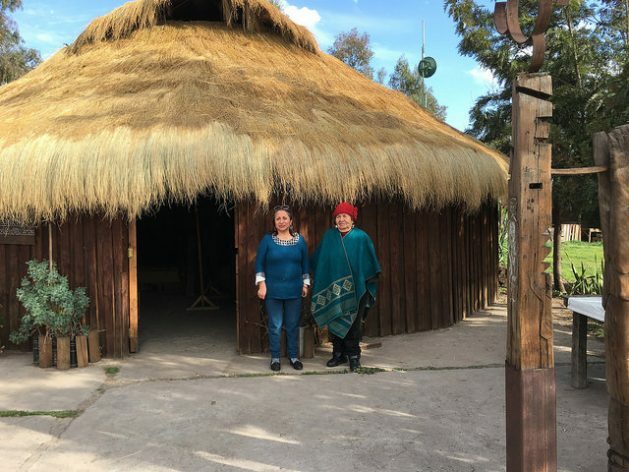 I gave birth to a five of them on the ruca,” machi (shaman) María Colipe Rucal, Juana’s 78-year-old mother, told IPS about her life in a rural community in Lautaro, referring to the traditional thatched-roof Mapuche houses, built with locally grown natural materials. A ruca built 21 years ago in La Pintana is now used for the Association’s ceremonies and meetings. Catrileo reminded IPS that for indigenous people, land is more than just a resource: “it is a common good…Land is a living thing, with all that production means: seeds, food sovereignty, modes of production, modes of community relations and community organisation,” she said. “The right to and free access to water as a public good applies to all Chileans,” but especially felt by indigenous people, she said. “Another important aspect is education that takes into account and enshrines the rights of interculturalism and makes indigenous people feel that they are an integral part of the educational process, and of specific educational plans and programmes,” she added. A new subject on indigenous peoples? The right-wing government of Sebastián Piñera announced its intention to include a new subject on the languages and cultures of indigenous people in the first six years of schooling (six to 11 years), for which it launched a consultation with indigenous organisations. 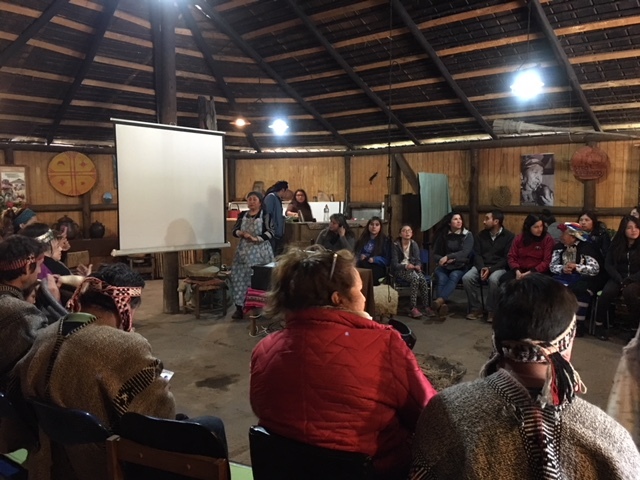 Some 50 Mapuche representatives from various municipalities of Santiago met in the ruca of the Kiñe Pu Liwen Association on Aug. 25 for a day of dialogue, debate and analysis of this proposal, which was handed over to indigenous organisations in June and will be under discussion until December. The government adds that its objective is to design common learning processes for bilingual intercultural education for the nine indigenous peoples legally recognised in Chile: Aymara, Quechua, Licanantai, Colla, Diaguita, Kawesqar, Yagán, Mapuche and Rapa Nui. “Knowledge must be delivered in rucas, in our own space, for experiential and participatory learning. We Mapuche have a lot to offer with respect to education,” she said. “Land isn’t about the soil, it has to do with all the natural resources that are at stake and that allow the Mapuche people to stay alive,” Millabur, who is also vice-president of the Association of Communities with Mapuche Mayors, told IPS. During a visit to the region in June, Piñera also said the government was preparing a plan for the Araucanía region, aimed at boosting local economic development with an emphasis on education, security, tourism, indigenous development, infrastructure and connectivity in rural areas. “As long as there is no justice for indigenous people, as long as there is no recognition of their rights, the rest is hollow words,” said the mayor after asserting that in his first term (2010-2014), Piñera “also made big, bombastic announcements, but not much ever materialised. “Chile has had a satte policy of not having public policies with respect to indigenous peoples, because it sees them as an internal enemy,” he said. Millabur criticised Piñera’s intention to use the so-called “land-grant titles” to carry out a definitive registration of indigenous lands, because those deeds date back to 1866, after the invasion of the Mapuche territory in Araucanía by the army, as part of a political-military strategy to reduce Mapuche communities to a minimum. “In a very short period of time, no more than 30 years, 10 million hectares became the property of the Chilean State, which from 1890 onwards handed them over to European settlers,” he said. For the mayor of Tirúa, the recognition of Mapuche rights must not involve the reform of a ” spurious and illegitimate constitution from the military dictatorship,” referring to the current constitution, which dates back to 1980, during the de facto regime of General Augusto Pinochet (1973-1990). “I don’t want to be part of a constitution where human rights have been violated and the Mapuche people’s rights are not recognised. There must be a plurinational constitution with a change that has to do with the re-democratisation of the rights of indigenous peoples,” he concluded.